Just before Thanksgiving, news broke that the Securities and Exchange Commission (SEC) received 3,001 tips to its new Whistleblower Office during fiscal 2012 (starting in October 2011). This undoubtably begs the question: How can we put that number into context? 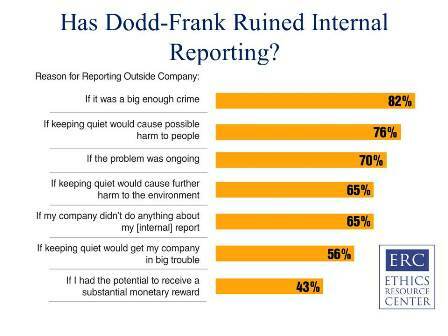 Many concerned CEOs and Corporate Counsels wondered whether the SEC Whistleblower Office would detract internal reports once it became operational. Would large bounties (ranging between 10 percent and 30 percent of a sanction of more than $1 million ordered by a court) from the SEC bring workers out of the woodwork with all kinds of allegations? Even frivolous charges could become very expensive. While 3,001 might seem like a large number of reports at first glance, it could be much higher. Trading securities based on "inside" information. There are certainly other kinds of misconduct that could be of interest to the SEC Whistleblower Office. But even if we limit the types of reports the SEC receives to those included in ERC's survey -- only .02 percent of those who could bring a report to the Commission actually did so. This could be one of those moments where both sides could be satisfied with the outcome. The SEC is receiving substantive reports of wrongdoing. C-suite executives can feel some relief that so far, their internal reporting systems are not being bypassed. The NBES findings also indicated that the potential to receive a substantial reward is not the primary reason most workers go outside their companies to report misconduct. In fact, it is the least important reason. When asked about motivating factors, 82 percent of respondents who reported said they would do so if it were a big enough crime. To see the ERC's research in detail, please go to the NBES website where you can download a free report.